Kebabs are delicious! But they’re not something most people can just whip up in their homes. Or are they? With the Vertical Rotisserie Grill, you can whip up your own delicious kebabs, right in the comfort of your home. 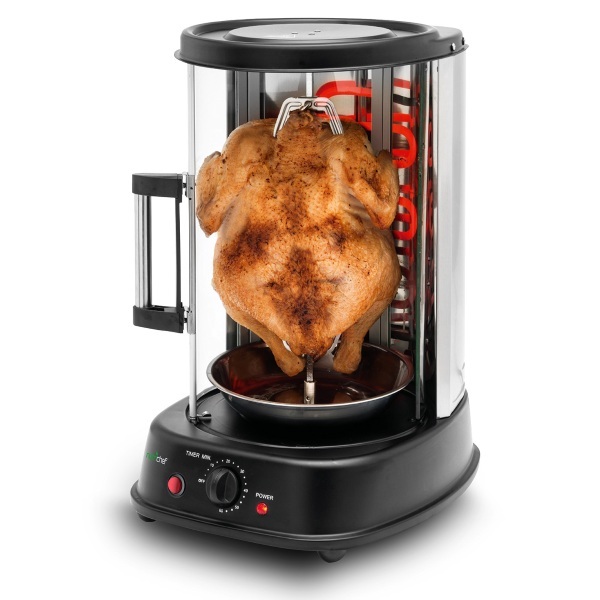 It’s a space saving rotisserie grill. Looks a little like blender but instead of smoothies, it makes yummy grilled meats. Just stick what you want on the pike, set it and enjoy some savory, great tasting. Well great tasting if you use spices. Gotta add flavor. It rotates as it cooks ensuring that everything is cooked evenly and quickly. As it grills, the fat drips away so that it can be collected and dumped. Or used in some other cooking method. Up to you. You can get one of these for $119.99.